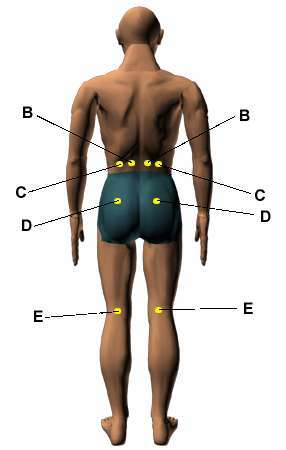 There are the acupressure points for relieving Lower Back Pain. Working on these points can help you get better quicker. You do not have to use all of these points. Using just one or two of them whenever you have a free hand can be effective. Location: Two finger widths directly below the belly button. Benefits: Relieves lower-back weakness, tones weak abdominal muscles, and prevents a variety of lower-back problems. Caution: If you have a weak back, the Sea of Vitality points may be quite tender. In this case a few minutes of light, stationary touch instead of deep pressure can be very healing. Location: In the lower back (between the second and third lumbar vertebrae) two to four finger widths away from the spine at waist level. Benefits: Relieves lower-back aches, sciatica, and the fatigue that often results from the pain. Location: One to two finger widths outside the sacrum (the large bony area at the base of the spine) and midway between the top of the hipbone and the base of the buttock. Benefits: Relieves lower-back aches, sciatica, pelvic tension, hip pain, and tension. Location: In the center of the back of the knee crease. Benefits: Relieves back pain; sciatica; knee pain; back stiffness; and arthritis in the knees, back, and hips.